Vocals: Little Sista. Electric & acoustic guitar: Cal Popejoy. Electric & acoustic guitar: Max Katz. Percussion:Bob Conti. Bass guitar: Ray Williams. Drums: Rick Parnell. Engineer: Mike Lesnick. Mastered by: Dave Mitson. Produced by Little Sister. Executive Producers: Sam U GeorgE. & Omari S.Tabu for AMUN. Publised by Lost Gold Publishing BMI. © Lost Gold Records © 2007 T-Kay/Street Solid records Scandinavia. (p) & © 2007 amun/T-kay/Street Solid Records Scandinavia. 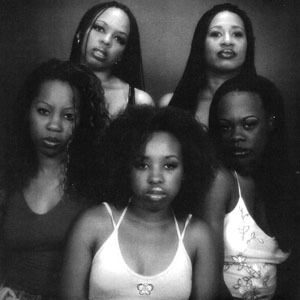 The US based 5 sisters super rock group “Little Sista” can be classified as one of African America’s top rankin rock group or infact, one of the world’s hottest female rock band in recent times. They sound pure, natural, solid, full of high energy and soul. They represent solid rock spiced with blues and gospel culture, at same time do represent the elegance of rock music from top to bottom. To see is to believe, and therefore we do recommend that you try to check out their fantastic track contribution “Black Girl” and you would agree that “Little Sista” as a band deserves to be heard. They are ready to storm concert halls, festivals and other related engagements. It’s a world class rock band and dream of any concert arranger. For further contacts & bookings in Europe: Page2 artists & management or AMUN-African Musicians in Norway. Tel: 47 48 11 39 96.